Civil society plays an important role in the provision of high quality family planning programs. Civil society organizations (CSOs) are often involved in expanding services, raising awareness, generating demand, and advocating for an improved enabling environment to ensure women and men have full, free and informed choice to determine whether and when they have children. Despite being a valued partner in many programs, there is little evidence on the contribution that CSOs have made to family planning and reproductive health (FP/RH) programs in terms of the types of activities undertaken and the impact that they can have. 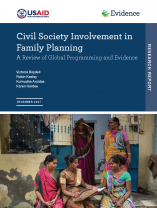 This review summarizes the evidence on civil society’s engagement in improving family planning programs and highlights the possible opportunities to further strengthen civil society engagement in family planning programs.